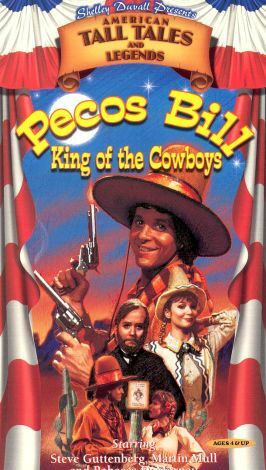 This episode of Shelley Duvall's American Tall Tales tells the story of Pecos Bill, a naïve but rowdy and immensely strong young man who was raised by wolves and eventually becomes the "King of the Cowboys." Bill (Steve Guttenberg) first appears as a ragamuffin man wearing diapers in prim and proper Petunia City. He later meets and falls in love with Sluefoot Sue (Rebecca DeMornay), the misunderstood tomboy daughter of the mayor (Martin Mull). A lively plot unfolds to include a stagecoach robbery and an escape to Mexico. As in Duvall's other storytelling series, Faerie Tale Theater, worthwhile messages are conveyed in an entertaining way. From the story of Pecos Bill, viewers young and old may learn that change can be a good thing, that looking at things from a different perspective is sometimes helpful, and that kindness should be rewarded.